"Our son has progressed in every way imaginable, and in ways we never imagined, thanks to Jumping Jax. Certainly he has picked up many physical skills, as well as the cognitive tools he needs to continue to advance." "The play space is warm and inviting and the therapists are some of the best in the business. We honestly do not know what we would do if we did not have Jumping Jax in our lives." "Our daughter was treated with kindness, respect and now with a year behind us, has made substantial improvements." "We highly recommend Jumping Jax. The facility is first-rate and we have been very impressed with the therapists and the quality of the therapy our 4 year old son has received. Most importantly, our son has really enjoyed going to Jumping Jax!" 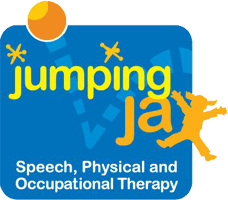 "Jumping jax has changed my sons life!! My son has been in OT/PT since he was 1. I tried lots of places. Amanda and Karinna met my son and from the first day on they have worked with him, played with him and challenged him!! They made him feel like he can do it. They understand both of us and always make time to communicate with me. I never feel like I’m taking them away from another client. We have been to therapists where we felt like it was a factory. Karinna and Amanda care!! Other gyms would hand me my son at the end of the session and i felt like they did the same obstacle course for each child. Jumping jax is a warm, nurturing place and I couldn't be happier with the progress my son is making there!!!!!! We love them!!" "When my husband and I received confirmation that our 4 year old daughter was diagnosed with Sensory Processing Disorder and that the next step was to find an OT, we were a bit overwhelmed. With a bit of research, we were lucky enough to find Karinna Dancourt of Jumping Jax right in our neighborhood. From the first meeting with her, she seemed highly knowledgeable and sympathetic with our "new" normal. Our daughter was treated with kindness, respect and now with a year behind us, has made substantial improvements. We have since moved, but are still regularly contacted by Karinna asking how our daughter is doing with her new OT and reiterating that she is always there for us. Karinna, and the success our daughter had at Jumping Jax has empowered her and us as parents. Thanks Karinna!!! "